An easy artisan sourdough bread that is mixed up in the morning and baked in an enamel pot for a perfect crust and chewy interior. 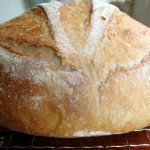 Looking for more sourdough bread recipes & ways to use your starter? Or just go here to see all of AOC’s sourdough recipes and tips! Do you have a video for this bread recipe? No, not yet Teri – we’ll put that on our list! This is a really great easy recipe. I made sourdough for the first time with starter my son gave me. Bread turned out super great, if not a little dense. My starter was probably too wet, but resulted in a nice, soft middle with a great crust. I think it could’ve had an even longer rise as it was a cooler morning. I will do that with the next loaf. Thanks for the eas recipe! Thanks for this wonderful recipe and technique. I am making this easy SD for the 2nd time today. Today I have a question about when in the active sourdough cycle is it best to use the starter for a recipe? I feed mine every 12 hours at 8am and 8pm. It is 100g AP flour, 100g active starter and 100g room temp water. Can the discard from the 8am feeding be used at 8am? 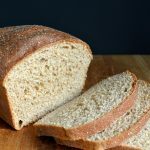 By far the best same day Sourdough Bread recipe I have tried. My starter doubles in 4 hours, so it is strong. The bread comes out perfect, great golden brown crispy, not tough, crust, and wonderful airy, slightly sour inside. I am thrilled, thank you. This is now my go to recipe for Sourdough Bread forever, and the bonus is it is ready in just over 6 hours. This is wonderful – thank you for leaving this great review. I’m so glad this is now a go-to recipe for you. If I don’t ave a Dutch oven and have to use a stone or cooking sheet, do I cover the dough with foil before baking? Or will I just have to deal with the bread however it bakes uncovered? Excellent excellent excellent. I was out of bread for the kids and we had an ice storm, so I was looking for a same day recipe for my sourdough starter. Stumbled upon this one. Used maple syrup in place of the honey, (we live in Vermont), and was astonished at how good this turned out. Its a big loaf. Tons of oven spring, soft, slightly open crumb, not an overly crunchy crust, great for little kids. Same day sourdough perfection. This one is going in my collection. Thank you! I made this yesterday, and it is incredibly good! I used 2 cups of King Arthur Whole Wheat and 1 c of King Arthur unbleached, added a tsp of yeast, 3 T of vital gluten, and 1/4 t of citric acid, Raised it in the microwave (cold, of course! ), heated the oven after the 2nd rising, put a glass corningware Visionware Dutch Oven in, and plopped it in. It turned out incredibly nice, and we went to bed last night with the house STILL smelling like homemade bread! So my dough was really wet I guess I should have addd more flour. Do you actually bake the bread at 450 degrees.? That seems way too hot. I bake it as written – the hot temp causes the fast cooking that creates the great crust. After removing lid you can lower to 425 if you’d like, but I’d take an instant read temp of the loaf before removing to make sure you’ve reached 200 degrees – you may have to cook longer. Hello. Can this be made in a glass Corningware pot, as I don’t have a Dutch Oven. Would I adjust the oven temperature? I’ve never done that, but you can sure try! I’d probably add foil around the lid to try and keep as much moisture in there the first 15 minutes (that’s what gives it the good crust). You’ll have to check the manufacturer’s recommendations for temperature to see how hot you can cook the pot and adjust from there. It’s a Corningware Visionware pot.I googled it, and Corningware says it can go in the oven up to 450*. I have been making sourdough bread for about 6 months. This is undoubtedly the BEST I’ve tried. After a series of tasty but disappointing ‘pancake’ flat loaves;this one was a dream. It rose higher than I had ever hoped for and it is the tastiest bread I have ever had; chewy crust, lovely crumb and an amazing light sour taste. I found the dough required quite a lot of extra flour for kneading. I left it in the bowl and kept adding fistfuls (about 4) and gently kneading it into the dough to get a satiny feel that wasn’t overly sticky. I let it rise in two sessions, turned into a Dutch oven and let it rise up again before baking. Heaven. Do you place the bread dough into the cast iron skillet for 40 minutes or is the 40 min for warming up? 40 minutes is for warming up the pot – the bread is waiting and then gets put in the hot pot. That’s how you get that good crust – the steam escapes from the dough hitting the hot pot and then bathes the loaf. Or at least that’s how I understand it, lol. It does what spritzing loaves with water while baking does. Followed the recipe as written but my dough rose hardly at all. The taste was good and the crust was nice but the bread was too dense. Has this happened to anyone else? 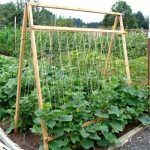 Should I try adding dry yeast? Without knowing everything about your kitchen, I’d guess your starter isn’t strong enough yet. Was it doubling in 6 hours or less when you used it? I made this loaf for the first time last week and WOAH! It didn’t even last until evening we devoured it so quickly. This time around, I steeped a sprig of rosemary in warm water overnight and am using that water as the called for amount in the recipe. Hoping it adds some extra flavor to an already delicious recipe. One question – the 40 min rise while the cast iron pot heats up. Is that primarily for the pot to reach adequate temperature, or is it crucial for the dough as well? I’m doing some batch cooking today and could sneak the bread in right after the 2 hour rise since the pot will be well and heated from all the other baking today. Thoughts? Glad your family likes the bread, Jamie! As for your question- It’s for the pot to be well-heated so the dough releases the steam right away to bathe the dough with moisture and get that good crust. Any way you can get that to happen is good.